The old SCJA is now called OCAJ. In other words OCAJ ~= SCJA. - This exam was designed for professionals who might not be programmers but who want to understand some aspects of the Java programming world. It's a very broad exam, but not very deep. For instance, this exam tests candidates on a basic understanding of ME vs. SE vs. EE. - Passing this exam (the OCAJ), DOES NOT fulfill the pre-req for taking the new OCP 7 exam. - This exam overlaps VERY LITTLE with the new OCA exam. Study materials for the old SCJA / OCAJ, WILL NOT prepare you for the new OCA exam. This new exam IS the pre-req for candidates without an existing SCJP certification who want to earn the OCP. - This new exam, the OCA, is MUCH deeper and harder than the old SCJA / OCAJ. In fact, this exam covers the same topics and depth and breath as about 60% of the SCJP 6 exam. It's deep and challenging! - Let me repeat: Study materials for the old SCJA, WILL NOT prepare you for the new OCA exam. You made this statement, "This (SCJA) exam overlaps VERY LITTLE with the new OCA exam. Study materials for the old SCJA / OCAJ, WILL NOT prepare you for the new OCA exam." SCJA: 1.2 Describe, compare, and contrast concrete classes, abstract classes, and interfaces, and how inheritance applies to them. SCJA: 1.4 Describe information hiding (using private attributes and methods), encapsulation, and exposing object functionality using public methods; and describe the JavaBeans conventions for setter and getter methods. SCJA: 1.5 Describe polymorphism as it applies to classes and interfaces, and describe and apply the "program to an interface" principle. SCJA: 3.1 Develop code that uses primitives, enumeration types, and object references, and recognize literals of these types. SCJA: 3.2 Develop code that declares concrete classes, abstract classes, and interfaces, code that supports implementation and interface inheritance, code that declares instance attributes and methods, and code that uses the Java access modifiers: private and public. SCJA: 3.3 Develop code that implements simple class associations, code that implements multiplicity using arrays, and recognize code that implements compositions as opposed to simple associations, and code that correctly implements association navigation. SCJA: 3.4 Develop code that uses polymorphism for both classes and interfaces, and recognize code that uses the "program to an interface" principle. SCJA: 4.1 Describe, compare, and contrast these three fundamental types of statements: assignment, conditional, and iteration, and given a description of an algorithm, select the appropriate type of statement to design the algorithm. SCJA: 4.2 Given an algorithm as pseudo-code, determine the correct scope for a variable used in the algorithm, and develop code to declare variables in any of the following scopes: instance variable, method parameter, and local variable. SCJA: 4.3 Given an algorithm as pseudo-code, develop method code that implements the algorithm using conditional statements (if and switch), iteration statements (for, for-each, while, and do-while), assignment statements, and break and continue statements to control the flow within switch and iteration statements. SCJA: 4.4 Given an algorithm with multiple inputs and an output, develop method code that implements the algorithm using method parameters, a return type, and the return statement, and recognize the effects when object references and primitives are passed into methods that modify them. SCJA: 4.5 Given an algorithm as pseudo-code, develop code that correctly applies the appropriate operators including assignment operators (limited to: =, +=, -=), arithmetic operators (limited to: +, -, *, /, %, ++, --), relational operators (limited to: <, <=, >, >=, ==, !=), logical operators (limited to: !, &&, ||) to produce a desired result. Also, write code that determines the equality of two objects or two primitives. SCJA: 4.6 Develop code that uses the concatenation operator (+), and the following methods from class String: charAt, indexOf, trim, substring, replace, length, startsWith, and endsWith. SCJA: 5.1 Describe the purpose of packages in the Java language, and recognize the proper use of import and package statements. The OCAJP7 (Oracle Certified Associate, Java SE 7 Programmer (OCAJP7) certification) does have extended coverage, especially in the case of constructors and exception handling. I hope this information assists our fellow certification candidates. I want to urge caution here. I'd much rather advise candidates to over-prepare rather than under-prepare. On the surface, it would seem reasonable to compare the wording of the old Sun objectives to the wording of the new Oracle objectives. Reasonable, but not accurate. There was virtually no overlap in the teams that made these two exams. In many cases, even though the objectives sound similar, the depth of questions on the new exam has been greatly increased. I'm really not slamming existing SCJA books. But those SCJA books were written for an extremely different exam than the new OCA. Full disclosure here... often people ask if Head First Java is good for any of the Java certification exams. I have said publicly many times, and I'll say it again now - Head First Java is NOT designed to help you prepare for any of the Oracle Java certifications. Similarly, when Sun moved the EJB exam to EJB 3.0 I was very forthcoming in the EJB forum, telling everyone that our EJB book would NOT be sufficient for the new exam. It was a good book for the old exam, as I'm sure the SCJA books are for the SCJA exam. 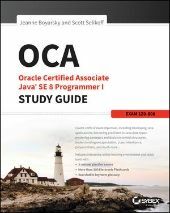 Since there is so much confusion regarding OCA/OCP Java 7 examination, wouldn't it be better to go for OCP Java 6 exam and then take OCP Java 7 exam as an upgrade? I am planning to go for " Java SE 7 Programmer I" , And i am interested in preparing from your & Kathy's Book "OCA/OCP Java SE 7 Programmer I & II Study Guide"
I really want to pass this exam ASAP ... and want to look forward for "Java SE 7 Programmer II"
May I Know when your new book will be available...Or if you can guide me from where i can get started to prepare for exam. Initially getting started from your book " Sun Certified Programmer for Java 6 Exam 310-065" would be helpful in preparing for " Java SE 7 Programmer I" ?? That would be very thankful.. I stumbled across the caveofprogramming.com videos on YouTube. They aren't a replacement for the prep materials but they are fantastic for practicing the multithreading section. I found them extremely useful. Unstickying now that the old OCAJ/SCJA have their end of life announced.